I silently congratulated myself for checking. It was a signed copy given, I assumed, by Nkrumah to some Egyptian acquaintance: Mohammed Ali is quite a common Egyptian name. The bookseller scrutinised the inscription and sold me the book at the slightly inflated price of 100 Egyptian pounds (around £9). Sitting on the bus afterwards, I began to think about that dedication. The words ‘with admiration’ stuck out. It seemed an odd phrase for Nkrumah to have used. Could it be the Muhammad (or, as Nkrumah spelled it, Mohammed) Ali? Back at the hotel it didn’t take me long to work out that it was indeed that Muhammad Ali. The two men had met in Ghana in May 1964. Looking at the photo of Nkrumah on the page facing the dedication I could now make out the trace of something that had been signed on top of it. ‘Muhammad Ali/World Champ/1964’. The puzzle was how the book had ended up in the bookseller’s apartment. The newly independent Ghana was the place to be in the early 1960s if you were a politically radical member of the African diaspora. As Kevin Gaines outlines in AMERICAN AFRICANS IN GHANA (2006), visitors or residents included Maya Angelou, Malcolm X, Richard Wright, Martin Luther King, Adam Clayton Powell, George Padmore, C.L.R. James and more. Frantz Fanon wrote much of THE WRETCHED OF THE EARTH in Ghana, and the year before Ali’s visit, W.E.B. DuBois died and was buried in Accra. In February 1964 Cassius Clay beat Sonny Liston to become world heavyweight champion and soon after that announced that he’d joined the Nation of Islam and changed his name to Muhammad Ali. In line with the black liberationist politics of the Nation of Islam, he decided that he wanted to ‘see Africa and meet [his] brothers and sisters’. Nkrumah’s Ghana was the obvious place to start. 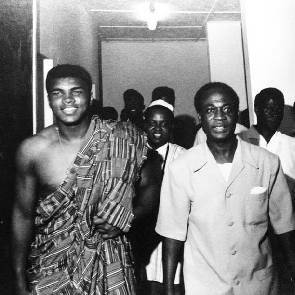 On 18 May Nkrumah, wearing a white safari suit, shook hands with Ali, who had the kente cloth the president had given him slung over his shoulder. Ali said he was meeting his ‘hero’. Nkrumah gave Ali his two books of liberationist pan-African political philosophy, AFRICA MUST UNITE and the recently published CONSCIENCISM. The GHANAIAN TIMES reported that Ali had ‘said he would greatly treasure the two books’. Ghana was the first stop on Ali’s African trip. 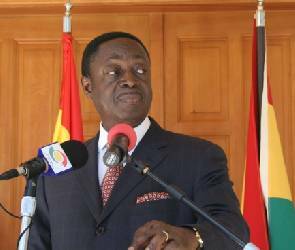 He spent two weeks there; he received the honorific name Muhammad Kwame Ali and fitted a large number of visits, meetings and boxing events into a relatively short stay. The finale was an exhibition fight in the packed national stadium in Accra, where, with his brother Rahman, he demonstrated how he defeated Liston. He also visited a zoo, Nkrumah’s party headquarters and (if an advert in the GHANAIAN TIMES is correct) demonstrated his dance moves at a club called Caprice. He next flew to Lagos, where he had promised to stay for more than a week. However, he shocked the crowd who’d come to meet him by saying he would only stay for three days and would not give an exhibition fight, as he had in Ghana. He apologised and promised he would come back to Nigeria as soon as possible. People wondered if there was more to it. One writer speculated that the Nigerian government had not treated him with the respect he deserved. Some interpreted as a jibe at Nigeria Ali’s declaration that Nasser’s Egypt had paid for plane tickets for all seven of his party to come to Cairo. He arrived in Cairo with his copy of AFRICA MUST UNITE on 3 June. Led by the minister for youth, a crowd of thousands – an incongruous mix of boxing fans, visiting students of many nationalities and Islamic scholars – came to meet him off the plane. He stayed until 23 June, visiting sites around Cairo; he kissed a statue of Nasser and was particularly taken with the Mohammed Ali Mosque; he travelled to Alexandria, Port Said and the new Aswan Dam. At the pyramids the guards, he later claimed, presented him with a stone weighing 2500 pounds; Al-Ahram reported that he had so much fun riding that he wanted to ride the horse back to his hotel. His guides disappointed him by telling him (rightly or wrongly) that it was illegal to ride a horse in central Cairo. He told a journalist that he would marry an Egyptian, if she agreed to come back to America with him. On 17 June he met Nasser, whom he had described, apparently forgetting what he’d said about Nkrumah, as ‘the best president in the world’ and his ‘role model’. On 23 June he left for America; all other promised destinations – Ivory Coast, Sudan, Turkey, India, Pakistan, China and Japan – had been removed from his itinerary. It seems fairly certain that the copy of AFRICA MUST UNITE, which he had promised to treasure, never made it out of Cairo. He had, after all, been loaded with presents. Some of them are mentioned in the press: the kente cloth Nkrumah gave him, two plastic busts of Nkrumah, two sets of carved wooden talking drums, a painting of himself in traditional Ghanaian dress, a painting with the inscription ‘Africa is now purified’ (perhaps the same item), a copy of the Quran, a traditional Nigerian outfit, a model of the Kaaba, a book of photographs of Cairo, a set of photographs of his visit to Cairo, a golden model of a mosque (which he gave to Elijah Mohammed, the leader of Nation of Islam), and the piece of stone from the pyramids. This story made the book I had bought seem much more important than I had at first imagined. Not only was it a testament to an important period in the history of Africa and America and a piece of boxing memorabilia, it was also evidence of the close connection between the Civil Rights Movement and postcolonial liberation politics in Africa. ‘This wind of change blowing through Africa is no ordinary wind,’ Nkrumah wrote on the first page of AFRICA MUST UNITE. ‘It is a raging hurricane against which the old order cannot stand.’ In 1966 Nkrumah was toppled by a CIA-supported coup and his books, along with those of senior figures in his party, were burned. After Egypt was defeated by Israel in the Six-Day War of 1967 Nasserism began to wane, as did the internationalist outlook that had made Ali so keen to visit Egypt. The book was beginning to seem too important to carry around Cairo in a plastic bag. I tried to send it back to the UK via DHL, but the man in the office told me that DHL could not send things more than fifty years old. I was about to leave Cairo myself, but since I still had the book, there was someone I thought I should show it to. After the 1966 coup Nkrumah’s Egyptian wife and his children moved to Cairo, to a house Nasser gave them on the corniche. Nkrumah’s son, Gamal, still lives there. I had never met him but we have some friends in common and his name occasionally appears on my Facebook wall – his account is noticeable because he posts in capital letters, always closing with either FORWARD EVER, BACKWARDS NEVER or ENJOY. Surely he’d be the person to advise me what to do with the book – and anyway it seemed a good excuse to meet him. I persuaded a friend to call him and tell him about the book. He didn’t seem particularly pleased. He said that the meeting with Ali had taken place shortly after an assassination attempt on his father. I was leaving early on Saturday morning and Gamal was busy on Friday. But on the Thursday evening I was going to a concert by the Nile Project at the Mohammed Ali Club. It was perfect. The Nile Project is a new musical collaboration between the countries of the Nile – surely inspired by pan-African feeling. The name of the Mohammed Ali Club has nothing to do with the boxer but the coincidence was nice nevertheless. I told my friend to tell Gamal that I would be there if he wanted to meet. I don’t think he came. If he did I didn’t see him. By the time I got to Beirut I wanted the book off my hands, but I wanted to feel that it was going somewhere suitable. I was reading up on the Schomburg Center, a repository of African-American books and history in Harlem, when I unearthed another side to the story of Ali in Africa. He was not the only African-American visitor to Ghana in May 1964. Malcolm X had been to Saudi Arabia for Hajj and had also visited Egypt and Nigeria. Ghana was his last stop before returning to America. Whereas Ali had just announced that he’d joined the Nation of Islam, Malcolm X had just announced his split from it. Ali was received with pomp and ceremony by Nkrumah: he had to be more careful with the more radical Malcolm X. A meeting was eventually brokered by Shirley Du Bois. The Schomburg Center is on Malcolm X Boulevard in Harlem. This, it seemed to me, was where the book belonged, its presence symbolically reconciling the two men. But if I sold my copy it might fetch enough to keep me going after my PhD funding runs out. I have lost sleep over the decision. Only a few weeks ago the battered copy of AFRICA MUST UNITE seemed to be an exciting and lucky find. Now it seems to be weighing me down. London Review of Books, Vol. 38 No. 10, 19 May 2016 » Raphael Cormack » Short Cuts pages 14-15.